40 posts categorized "Guitar Center & Musician's Friend"
On December 5th, I finally broke out of my classical violin mold of the last 27 years and played live in a rock band, The Kung Fu Koalas, at a venue in Medford for the Musician's Friend Acoustic Jam. I had such fun. It was a riot. Thanks so much to Chris Tso, Ryan Barney, and Ryan Bouslaugh, an amazing bunch of musicians who let me sit in with them. I must admit that when Chris handed me a CD with "Funkytown" and "Runaway" on it, I was a little dubious. I had to play the songs over and over so I could figure out what to play and since there wasn't any sheet music, I just had to learn by ear. Fortunate that I'm pretty good at that at least! We practiced during several lunch hours at work and they couldn't have been more patient or more supportive of a newbie rocker like me. :) And poor Jeff--he had to listen to me practice those two songs incessantly for an entire month. To hear my big debut, go to MySpace and play the two songs I performed live with them, "Funkytown" and "Runaway." You've probably never heard either of those tunes with violin accompaniment! We did it all with a wink. The recording isn't the best, but hey, I'm just glad I have something to remember it all by. Everyone kept saying I looked so serious on stage...I'm sure I did. I was trying to concentrate! MusiciansFriend.com's wildly popular Stupid Deal of the Day is now available via RSS. This Thanksgiving Weekend: Take A Lot Off The Top! 15% Off Friday OR 10% Off Saturday and Sunday. Find a store near you or call us at 866-498-7882. Don't forget! Guitar Center will beat any competitors' Thanksgiving offers! Bring in their postcards, coupons, or ads, and we'll beat it by giving you 10% of the difference. Hundreds of items below our everyday low price – many below our cost. Can't decide? Buy the musician in your life a Guitar Center Gift Card redeemable at any Guitar Center retail location or online at GuitarCenter.com. Perfect for the musician in your life and just in time to kick off early holiday shopping! Save 15% off any single qualifying item at Music123.com, now celebrating 80 years in business! This is a special friends & family offer on thousands of musical instruments and related gear. Expires Friday, November 21. Forward this to all your friends! ***NEWSFLASH*** As of 12/12/08, Stupid Deal of the Day is now available via RSS! Today's Stupid Deal of the Day at MusiciansFriend.com is KILLER. Snag one before they sell out--they're going like crazy. The MS7510 Mic Pro Pack is a smart way to buy a good microphone with all the vital accessories, especially at this Stupid Deal price! 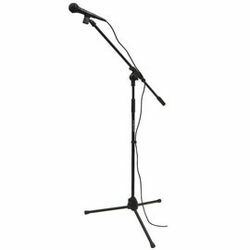 The On-Stage Stands MS7510 Mic Pro Pak includes an Audio Spectrum AS400 dynamic microphone with bag, a tripod boom mic stand, mic clip, and a 20' mic XLR-XLR cable. The AS400 vocal mic features a cardioid pattern, a frequency response of 80Hz to 12kHz, and a sensitivity of -74dB+/-3dB. Yesterday, Musician's Friend gave over $6,800 worth of musical gear to Josiah Leming, the former American Idol contestant who lived in his car and was booted off the show before making it to the final 24. I was rooting for him and was surprised he didn't make the cut, but anyway...over the weekend we got a call asking us to donate a gift package for his appearance on The Ellen Show yesterday. We put together a sweet prize and the giveaway got mentioned on Access Hollywood and AOL.com. Anyway, I wish Josiah the best of luck! Here's his MySpace page and here's a video of him performing "One Last Song." Legalese: My blog is personal and has no affiliation to Ellen Degeneres, The Ellen Show or American Idol. Nothing I say on my blog has been in any way endorsed by Musician's Friend or Guitar Center and reflects my own personal views only.. So there. Musician's Friend: Presidents' Day Clearance Event! Extra savings on over $2 million worth of inventory from overstocks and returns to refurbs and discontinued gear. Ends 2/19. Guitar Center: One-Day-Only Presidents Day Sale! Starts at 10am at your local Guitar Center Store or call 866-498-7882. Presidents Day price-cuts plus special one-day-only financing: 2/18 only. I went a day late to NAMM this year and had a lot of meetings, so I didn't get to walk the floor as much as I did my first time. Still, it was a blast and I saw great gear, live music and lots of shredding. George Benson at the Ibanez booth. My camera went dead right when I walked up, of course. Gorgeous handmade, custom Pinstripe Drum Set from Pearl. Handpainted by Nub from Orange County Choppers. Liquicy Cymbals from Hammerax. I have to say, I am not a drummer, but these were very cool and had a really interesting ripple feel. Hot Hand from Source Audio is pioneering motion-controlled effects. This is nifty. You wear a special ring that enables you to control your effects with your hands. Click here to see Chuck from the band Moe trying it out. Seeing it makes more sense than reading about it. I want this for my electric violin! Joe Satriani and Herman Li from Dragonforce on stage with his Hot Hand Effect during the Ibanez Guitar Jam. 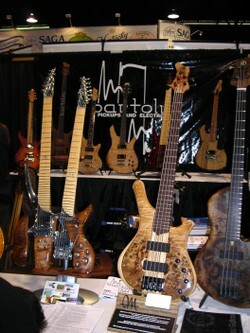 Bartolini known for pickups and electronics was sharing a booth with Spalt Instruments in LA which makes really beautiful guitars and basses. One of the things I like about going to NAMM is being able to check out boutique products--some of which we sell, and some we don't, but hey that doesn't stop me from looking at them. Musician's Friend is a sponsor of the John Lennon Bus. I was getting a tour of the bus which is very cool btw from Brian Rothschild who is the Executive Director of the program and we accidentally interrupted a video shoot on the bus with Bruce Greenwood who donates his time to the cause. Yes, I met him and he was quite nice. 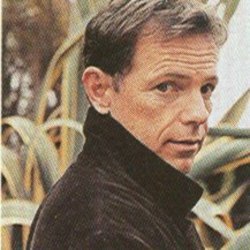 No, I did not say how much I liked him in that TV series "Nowhere Man" (even though I did!). I don't watch "John from Cincinnati" on HBO but that is the show he's on now. The John Lennon Bus was right behind one of the outdoor stages at NAMM. I saw YES frontman Jon Anderson with the amazing School of Rock students. Here they are performing "Starship Troopers," but they also did a couple of other tunes. Later that night, the School of Rock kids performed in the Marriott lobby. The highlight was one of the kids rocking "Institutionalized" by Suicidal Tendencies. What a classic song. Someone told me this was the Joe Satriani guitar. I can't confirm or deny it. 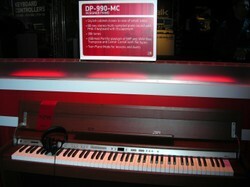 Spent quite a bit of time in the Roland booth playing digital pianos, including this DP-990 with 3D Sound Control which they say is as close as you can get to a concert grand. I am not sure I can vouch for that, but the sound was impressive. Fender booth was packed as usual. Custom Shop Guitars video here. I leave you with Ozomatli at the m-Audio booth. I really really like this song which is called "Can't Stop Now." Makes me want to dance, every time I hear it. 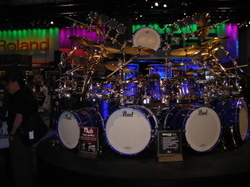 For all of my pictures from NAMM 2008, click here! And for more videos and photos from this year's NAMM, check out HarmonyCentral.com's in-depth coverage of NAMM 2008. To pre-order NAMM 2008 products, including these gorgeous Ibanez guitars, click here. The biggest music gear show in the U.S.--lucky me! :) If you want to find out more about the hottest and newest in musical instruments--from self-tuning guitars to high-tech keyboards, mics, amps, drum kits and more, go to http://www.MusiciansFriend.com or http://www.HarmonyCentral.com where you can pre-order products, watch videos from the NAMM floor, etc...a gearhead's dream! 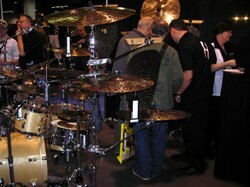 Pix of me at last year's NAMM! 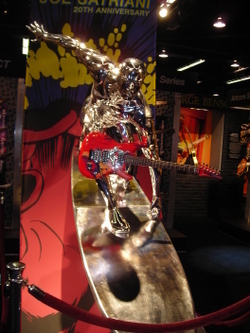 *** Update: Here's my 2008 NAMM recap and my NAMM 2008 photos.